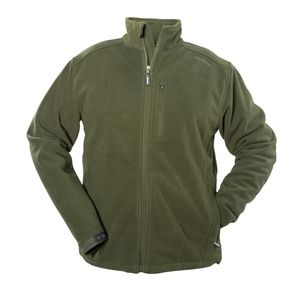 Snowbee Breeze Bloc Fleece Jacket - 360g/m2. This new model uses a double layer of high density microfleece with the breathable, waterproof membrane laminated between. Although it has an overall weight rating of 360g/m2, the material is only 3mm thick, making it ideal as a layering garment underneath an outer waterproof shell, or as an outer fleece on those chilly spring or autumn days. Fitted with two zipped side pockets and a zipped chest pocket for mobile etc, and low-profile Velcro cuff adjusters. Fitted with two zipped side pockets and a zipped chest pocket for mobile etc, and low-profile Velcro cuff adjusters. The fleece is a good fit have worn it while fishing and it does keep the wind out and if need be used as a middle layer no problem its a good product.